Ligne de mire | One quality, the finest. 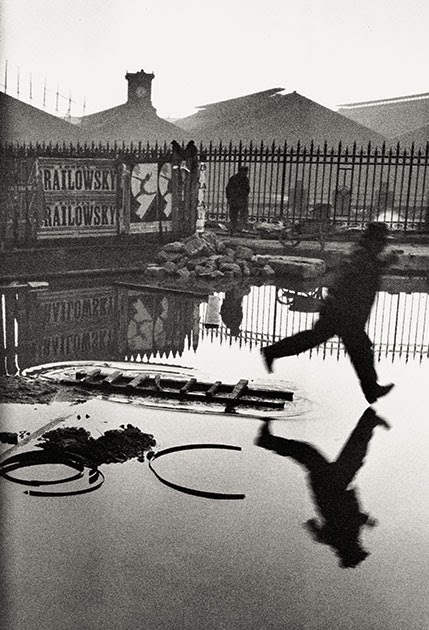 The Centre Pompidou has an exhibit dedicated to Henri Cartier-Bresson, famous for the “decisive moment,” or the photographer’s genius at grabbing a shot at precisely the right moment. The five hundred works on display mark the 10th anniversary of his death. Using more than 500 photographs, as well as his drawings, paintings, films, and documents, bringing together well-known images as well as unknown ones, the exhibit shows not just the history of this photographer, but also the 20th century. 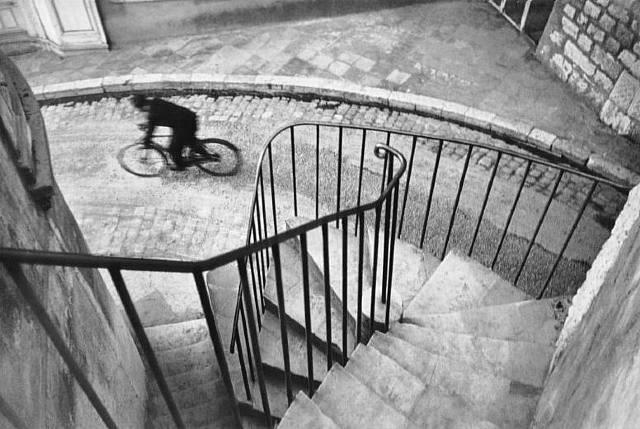 “Photographier c’est mettre sur la même ligne de mire la tête, l’œil et le cœur,” (foe-toe graf-e-ay seh metruh sir lah mem leanyuh duh meer lah tet, loy ay luh kur) said Cartier-Bresson, which means “Photography is to put the head, the eye, and the heart on the same focal point.” (Ligne de mire can also be translated as the line of vision, of sight, or of fire, but since we’re talking about photography, I went for focal point.) I really like this idea of bringing your whole mind and body into harmony with the picture being composed. 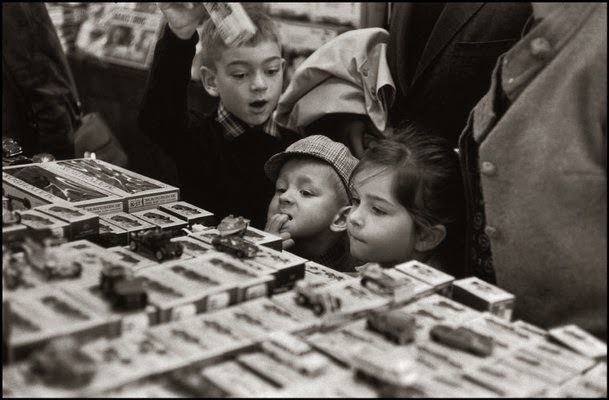 Active from the end of the 1920s until just before his death in 2004, Cartier-Bresson left an inventory of thousands of prints. These have now been carefully sifted and catalogued by the Foundation that bears his name. In addition, its archive of notes, letters and publications are now available to researchers. After all this analysis, the exhibit proposes that simply to categorize this vast body of work as evidence of the “decisive moment” is an oversimplification. The retrospective at the Centre Pompidou shows the richness of the journey of the photographer, his successive shifts, and the various stages of his development. It aims to demonstrate that there were not one, but several Cartier-Bressons. From Surrealism to the movement of May ‘68, passing by the Spanish conflict, World War II, decolonization, the Cold War and the post-war boom, the Centre Pompidou retrospective offers, instead of myths and short-cuts, a comprehensive new reading on the work of the most famous French photographer. The exhibit is open until June 9, 2014. This entry was posted in Photography and tagged Centre Pompidou, French photographer, Henri Cartier-Bresson, ligne de mire, Photographier c’est mettre sur la même ligne de mire la tête l’œil et le cœur, the decisive moment. Bookmark the permalink. Thanks for reminding me just how wonderful black and white photography can be. 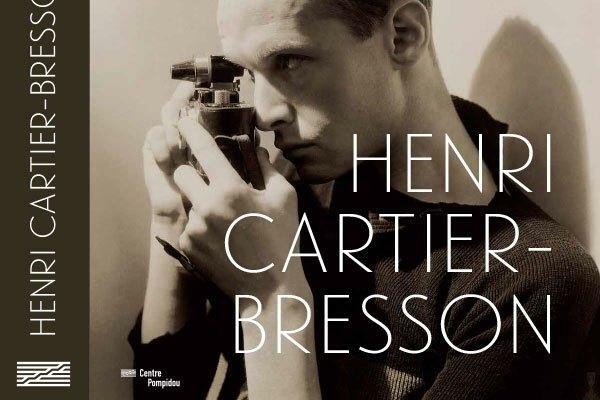 And Henri Bresson Carter was a wonderful exponent of it. I agree. That shot of the stairs is just perfect. The blur of the cyclist changes a static architectural shot into something living.